"I'm from Buenos Aires. Can I have a picture with you?" "Would you sign this for my grandson?" Graciously, he smiles for the cameras and signs their papers (and T-shirts and arms), and thanks them for the kind words. "See you later tonight!" says a young man from Germany wearing a U2 T-shirt. "I'll see you later tonight," replies the man dressed entirely in black, wearing iconic sunglasses and a rosary necklace. The crowd recedes, drifting back to their own tables and it's just the two of us again, me and the guy who looks just like Bono. "And that's what it's like," says Pavel Sfera, the man who makes his living by wearing the face of another. The man with the famous face takes a seat on the patio of The Catch restaurant a few hours before U2 is supposed to play across the parking lot at Angel Stadium of Anaheim, and before he's finished half a sentence he is swarmed by other diners. "I saw you at the Rose Bowl." Born in Yugoslavia to Romanian parents, Sfera, 45, grew up in Hawthorne. He was 14 when U2 made its 1980 debut with the album "Boy," and from then on, Sfera says fans of the Irish band did double takes at his uncanny resemblance to the band's lead singer. By 1987, when the album "Joshua Tree" made U2 worldwide superstars, he was hearing it more and more. Still, he had his own musical interests to pursue then. He played classical piano and studied opera. He worked as a singing gondolier, and he sang in a restaurant, taking requests from the dinner crowd. Still, by 2001, he wasn't singing much. He was working in property management, a little bored. And when his beloved father died that year – and he examined his own life — Sfera wondered if perhaps the face his father and mother's DNA had provided might, in turn, provide him with some excitement. So he signed on with an agency that booked celebrity impersonators. "And the phone calls started." We leave the restaurant and head to the stadium were several thousand U2 fans are already in line. When the inevitable happens – when some fans see who they think they see – the rush is almost frightening. Security guards, apparently taken in, form a circle around him. Still, as fans approach, some are so awestruck they nearly weep. One woman, an aging baby boomer, trembles as she holds out the sleeve of a vintage U2 single. She wants him to sign, but he signs her arm instead. It's one of Sfera's rules, self-imposed, of Bono impersonation – never sign something of value. • Never sign Bono's name. Instead, Sfera signs his own, or writes a Bono-esque message of peace and harmony. • Never tell them you actually are Bono, but let them believe what they want. "When people start believing, if it doesn't get out of hand, I'll let them believe. People love the man; I love the man." By now he can usually tell in a glance whether someone does or doesn't buy that he's Bono. Today, with U2 in town, his presence in the parking lot seems semi-plausible. Still, as we hear U2's sound check inside the stadium, Sfera is bemused by the eagerness of fan logic. "Here's the oddity," he says. "U2 is playing right now, and I'm out here?" For the past seven years, being Bono has been Sfera's full-time gig. The most lucrative Bono work involves solo appearances for corporate clients, jobs that can pay from $500 an hour to up to $10,000, depending on time and travel. But the most fun, it seems, involves performing as Bono. Sfera fronts three different U2 tribute bands, in Southern California, Las Vegas and Italy. Though the shows typically are small affairs, he recently played a gig at a soccer match in Spain in front of some 20,000 people. As we walk around the stadium, Sfera bumps into a friend he knows from his work with the Vegas version of U2. "He's the most amazing Bono ever," says Evelyn Robb, momentarily forgetting, perhaps, the Bono in the stadium. As for his competition in the world of Bonos (he knows of at least four others just in Southern California) Sfera offers generous praise. "I oftentimes say they sing better than I do," he says. "But what I think I have over them is the present look." When he's off Bono duty – when the glasses are off and the all black wardrobe is in the closet – Sfera lives well as Sfera. His got an album out, of classical piano, available on iTunes. He volunteers to help disaster charities and to help orphans in Ensenada. And, closest to his heart, he's writing a book about his father, about the man's harsh treatment in a Yugoslavian prison where, Sfera says, he was imprisoned for his Christian faith. "I don't do politics. I do love and humanity," Sfera says, practically channeling Bono. "I think some of the creative stuff I do, some of the charity stuff I do, make my life very full," Sfera says as he gets ready for a corporate meet-and-greet in Huntington Beach. "I feel a lot of love from the people, too. And that's good." Postscript: On the Monday, after U2's weekend shows in Orange County, Sfera sends an email saying that he ended up going to both shows. During the second, he made it to the front row of the inner circle. There, Sfera says, the following happened. "After one of the songs, Bono recognized me, pointed, giggled (and) walked over from center stage to say 'Hi,'" Sfera wrote. "I reached around to remove my rosary. Gave it to him. He put it on and wore it through the rest of the show... many times holding onto it (for) dear life." Skeptical? Us too. But Sfera included a YouTube link to the video he shot of all this, and even with its grainy point-and-shoot quality you can see that this is pretty much what happens. "Friends took photos with him the following day at the hotel, and he still had it on," Sfera says in the email. 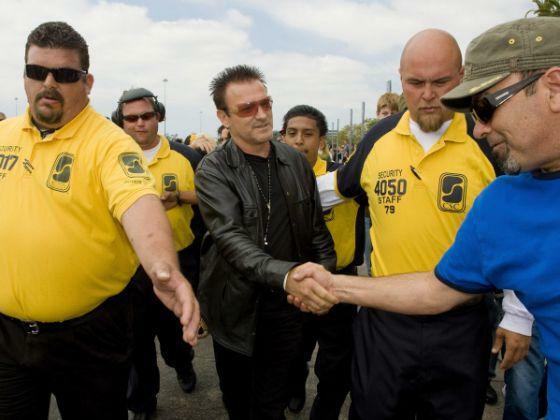 Bono impersonator Pavel Sfera, center, is escorted by security at Anaheim Stadium as U2 fans clamor to shake hands with the man they think is the legendary Bono.